Every Sunday as the church gathers, people come full of smile for the most. Some of these smiles are legit. Happy faces, happy people, real happy people. If life is a landscape of mountains and valleys, these happy people are camping out in the Himalayas. But for some people, the smile is more of a mask. Being a minister, I’ve met some of those smiles masks and have been invited in when it was removed. What has been hidden is the shame and weeping under the weight of past sin. Unfortunately, some of these people have never really heard about God’s grace. So here is an idea. People still need to hear of God’s grace. You need to hear of God’s grace. I need to hear of God’s grace. Let this grace of God be preached and let it be taught. When people gets this, they get it: While we were still powerless sinners, God loved us and Christ died for us! This is why Paul says that we can “rejoice in the hope of God’s glory” and “rejoice in God through our Lord Jesus Christ” (Rom 5:2, 11, NET). But to rejoice, we must truly hear this grace of God and believe it. I don’t mean hear it and agree with it. Intellectual agreement is nice but believing comes from the heart. When the grace of God gets you in the heart, then you can hear it, believe it, and rejoice in it. This entry was posted in Contemporary Culture, Faith, Missions and Ministry, Scripture. Bookmark the permalink. So fundamental, so necessary. 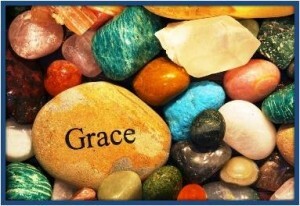 To understand what grace is is to look into the very heart of God. If we have really been touched by it and have felt its overwhelming power how can we not move in ways that praise the Name and extend that same love to our fellow human beings. What a marvelous God we serve Who’s very nature is to shower His grace and mercy to His beloved created. We are indeed truly blessed. Great way to start my day, Rex, thanks for the thoughts.